Thank you for your interest in CatSofa, the world’s only claw-friendly living room furniture. The CatSofa is an upholstered sofa with a twist — instead of a single layer of upholstery, the CatSofa features twelve layers of fabric in different, coordinating colors. 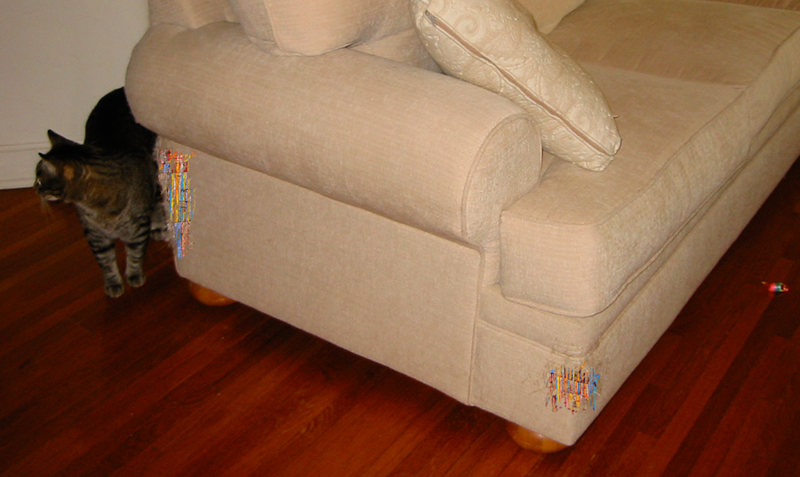 When your cat scratches the sofa, she exposes hidden layers of upholstery, creating a stunning work of art. The more your cat scratches, the more attractive your sofa becomes! The order process is simple — just select a sofa size and upload a picture of your cat. Our team of expert designers will select fabrics that coordinate with your cat’s coat, and our skilled craftsmen will create your custom, claw-friendly couch. Prices start at $50,000. If you have more than one cat, feel free to send pictures of all of them; however, there is a 10% surcharge for each additional cat, because of the extra work involved in fabric selection. “I ordered a CatSofa over a year ago; they cashed my check promptly, but I haven’t heard anything from them since. They won’t respond to any of my emails, and when I try to contact them by phone, I get a recording saying the number is no longer in service”. Visit our community website to upload pictures of your cat’s handiwork, rate other people’s creations, schedule a CatSofa party, and more! Some of our customers have used time-lapse photography to create amazing movies showing their CatSofas as works-in-progress; check them out on the community site, then create your own with our CatSofa Photography Kit (only $7200 at the CatSofa Store). The CatSofa community website also hosts the CatSofa Artwork Contest — enter now for a chance to have your CatSofa artwork featured in the next edition of the CatSofa Book. The CatSofa Book is a beautifully-bound hardcover book, packed full of gorgeous, full-color pictures of actual CatSofa art. It’s a must for any coffee table. “Move over Hans Silvester — the CatSofa Book is the most beautiful book of its kind that I’ve ever seen”. Standard Package: We bring one of our SofaCats to your home to scratch your existing sofa. Some restrictions apply; prices start at $2500/hour, with a 4-hour minimum. Call for details. Special Customized Package: Your cat scratches your sofa in your home. Prices start at $3000/hour, with a 4-hour minimum. Call for details. LOL . . . I’m guessing this would work for dogs who chew too? Good question — we’ll have to run some tests. I’m not sure whether 12 layers of upholstery fabric will hold up to that kind of treatment, or whether we’ll have to use more layers or stronger materials. Yeah, what I actually need is for somebody to manufacture some attractive, but indestructible fabric which is puppy proof. Our “puppy” likes duvet covers especially. lol! Does it come with a pouch where the cat can store his/her prey of the day? We have something much better than a pouch — every CatSofa features UnderCouch Empty Space built right in and ready to use as storage for toys, prey, or other small objects. I had a cat that COMPLETELY shredded a chair once. She was 14 yeas old when she passed and i have never yet wanted another kitty. . . But the cat sofa is a great idea for doing something creative with a natural cat behavior! Move over Van Gogh and Warhol! “Chair Metamorphosis” sounds like an awesome work of art; your cat must have been exceptionally talented. I can understand why you might feel that no other cat could possibly live up to her legacy. I need some cat furniture whose colors blend nicely with thrown-up cat food (mostly a mustardy-yellow) and hair balls (mostly tabby gray). Good news — our designers can select fabrics that coordinate with just about any substance! When you place your order, include photos of all the substances you want to match (there will be a 10% surcharge for each). Photos only, please — no samples!